The swarms of people crowding the entrance to Faneuil Hall Marketplace on Wednesday were not there to catch a performance by break dancers or street musicians. They had a hankering for some grass- hopper-infused turkey burgers with a side of cricket cookies. 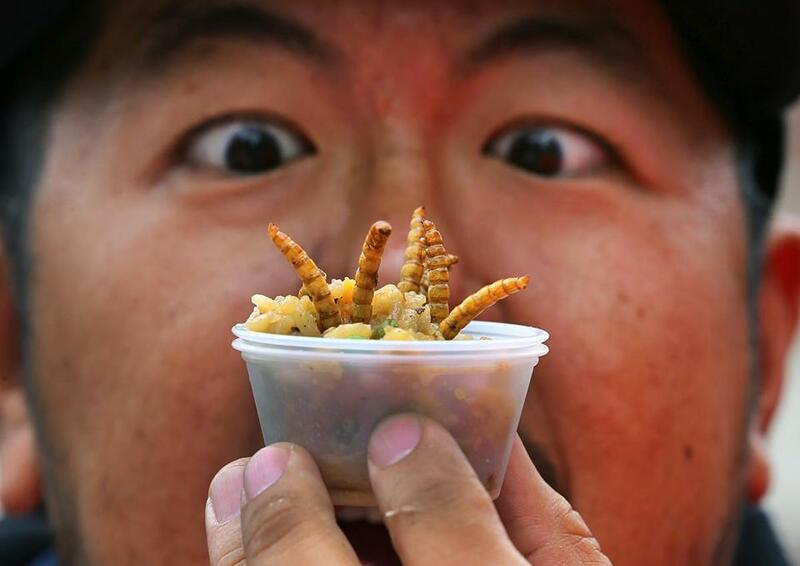 “Most people are creeped out by pests, but all of these people showed up willing to line up and come in to try things out,” said John Myers, president of Ehrlich Pest Control, the company that hosted the charity event, called Pestaurant. Participants gathered around the plaza at the charity event, challenging one another to toss back peppered mealworms and bite down into cookies with cricket heads poking through the soft dough. Groups of schoolchildren formed a circle, letting out shouts as their peers dropped crunchy insects down their gullets. Across the way was a cricket-eating contest, and more than a dozen people accepted the challenge. When it was done, some contestants’ faces were contorted in disgust, but others were indifferent.